The Easy Rest Adjustable Bed product line offers our customers the finest and most advanced adjustable beds on the market today. Our sleep system has been engineered from top to bottom, inside and out, to create the finest, cutting edge product for consumers who expect nothing but the best. Our mission is to help them achieve a quality night’s sleep, improve their intimate experiences and enjoy comfort any time of day. We have researched and tested countless types and styles of mattresses on bodies of all sizes and weights. This research allowed us to create a revolutionary new replaceable pillow top mattress that allows you to choose the comfort and feel of your mattress. If your preferences change over time there’s no need to buy a new mattress – simply change out the custom insert. Our mattress gives you the long-term support benefits of an innerspring mattress, with all the comfort and advantages of a pillow top model. The insert of your mattress can be as soft or firm as you desire. 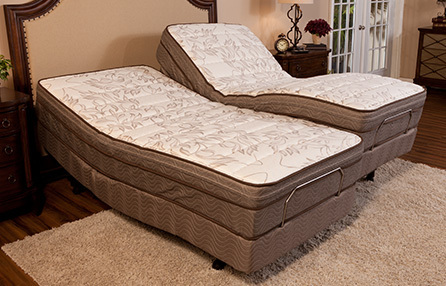 Partners who have a dual bed system can each choose their own insert for personalized comfort. No more compromising your comfort for your partner’s benefit. Advanced manufacturing technology prevents interior mattress components from shifting and interfering with one another during the thousands of flexes an Easy Rest mattress goes through during a lifetime of use. This helps to extend the life of your mattress. Custom technology allows the rejuvenating waves created by the therapeutic massage motors on your bed to reverberate evenly across your mattress, turning it into a unique therapeutic massage mattress. Our optional heat feature allows you to warm up the mattress on a cold winter’s night or soothe aching muscles and joints any time of year. Our 20-year pro-rated mattress warranty is one of the best in the industry. Easy Rest Adjustable Bases are made in a modern, state-of-the-art plant using advanced manufacturing techniques. The same expensive parts and manufacturing technology, quality control and care used to manufacture adjustable hospital beds and dental chairs are used in the construction of Easy Rest orthopedic beds. Exclusive Whisper Power® lift motors raise and lower the head and foot of your bed quietly, smoothly, reliably and virtually maintenance-free for the life of the bed. These motors come with a lifetime guarantee. Popular Headboard Glider™ Feature gently glides the base toward the wall, allowing full access to your nightstand and lights. Wireless hand controls have simple, easy-to-understand buttons that are backlit to make it easy to see in low light and dark environments. Remotes have memory features to save your favorite positions and adjust to each with one touch. Durable carbon steel frame is recessed for safety and powder coated in non-toxic, lead-free enamel paint to protect it from rust and corrosion. Electrical components are carefully assembled and rigorously tested for long life, reliability and safety. Attractive industrial strength casters allow you to lock your bed into place. You can easily unlock the casters to rearrange furniture or clean under the bed.